Greece wants to implement its own program of reforms, rather than be forced to allow the troika to do so, George Katrougalos, the country’s minister of administrative reforms, told RT on the eve of the emergency eurozone finance ministers' meeting. RT:What are you expecting from tomorrow's talks? 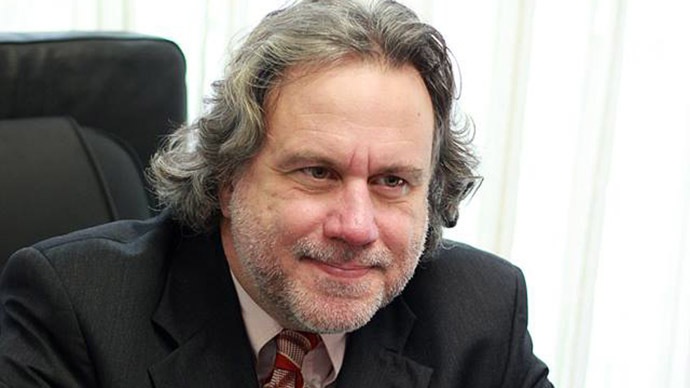 George Katrougalos: Well, we have started negotiating with our partners as equal partners in a union of equal states. And this is the first time for Greece because until now, we were negotiating as a debt colony. So we hope that we are going to reach a mutually beneficial agreement with our partners...because we don’t demand any more money, we demand just time in order to implement our program, the program [which has been] voted by the Greek electorate to the government. It seems now to have, according to the polls, more than 72 percent support from the Greek people. RT:What will the government's next step be in case the talks end in deadlock tomorrow? GK: Well, I’m going to continue to negotiate. We are persuaded that it’s not going to be an easy negotiation, but we are not speaking just for ourselves; we are speaking for all the peoples of Europe that want to see an end to the austerity policies. Because these austerity policies have not just devastated our economy and our society, they [have put] Europe at its knees. We are now very close to economic stagnation and deflation. And if you look at the reactions within all European societies, there is now a clear cry against the continuation of these policies. RT:Wouldn't a new loan just further aggravate the country's debt crisis? GK: Absolutely. We don’t want any loan. Another new loan is going to make our debt even bigger. We do not demand anything like that from our European partners. As I said before, we just want some time in order to implement our program of reforms and show to our partners that we do not want to make our debt bigger to solve our problems but [instead we want to] form our own reforms, not reforms that are imposed to us by the troika or anybody outside Greece – because we want to change our state and our economy ourselves, not [from the] outside. RT:How seriously is the Greek government weighing up the option of Greece's exit from the eurozone? GK: We are not thinking about that, not even a thought, because we want to change Europe, not to leave Europe. We want to change the existing, the nowadays neo-liberal Europe, to a social one. We hope we can start a kind of domino effect, that we have now the first government of the left in Europe but not the last one. RT:How would that affect the eurozone? GK: Well, what we want to do is to persuade the other partners we have that the continuation of the austerity policies is an impasse. We hope that the reactions of the societies are going to be heard by the political elites. And in any case, there is not an alternative. A Grexit, an exit of Greece from the eurozone, would have a disastrous effect – it would destabilize the whole eurozone and this way nobody, I think, in Europe thinks, moreover, wishes a Grexit.